By May of 1970, protests against the Vietnam War were popping up with increasing frequency all over the United States, and especially on college campuses. The recent revelation that ex-president Johnson misled the country about events in the Gulf of Tonkin resulting in the escalation of the war in 1964, the end of college deferments, and the increasing numbers of American casualties led to a surge of protests, some of which turned violent. After President Nixon’s announcement on April 30 that American troops had invaded Cambodia, anti-war activists began to protest with even greater zeal. Even the average American saw Nixon’s actions as a direct contradiction to promises he’d made to end the Vietnam War. Protests were staged on college campuses all over the country on May 1, including Kent State in Kent, Ohio. The tension between police and protesters resulted in acts of vandalism, so the mayor of Kent closed the bars, declared a state of emergency in town, and called in the National Guard. These actions only escalated the bad vibes in Kent, and a boarded up ROTC building was set afire by the students (or someone wanting the students to be blamed) on May 2. The National Guard attempted to establish order by throwing tear gas into the crowd. 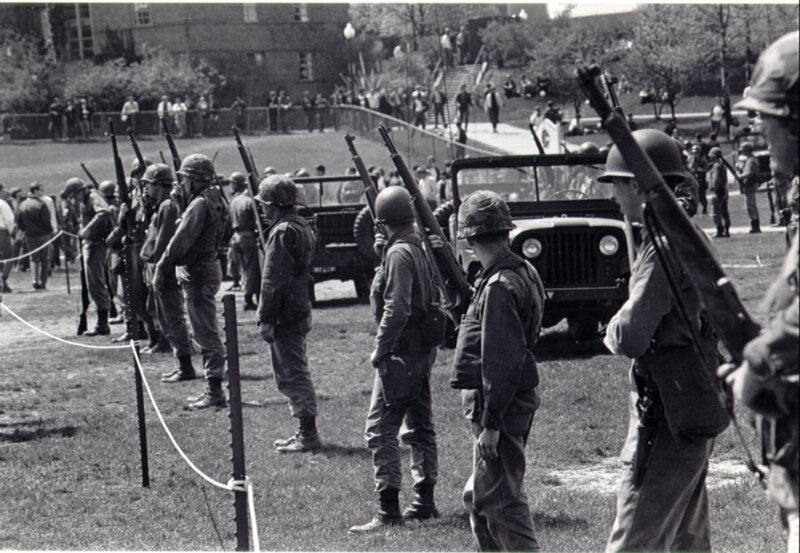 The Governor said he would seek a court order giving control under martial law of Kent State University to the National Guard – an action he never took. 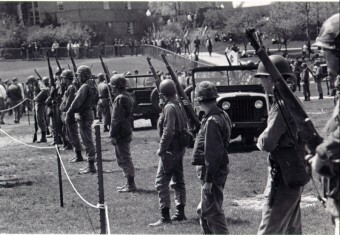 Two skirmishes between student protestors and the Guard occurred on May 3 that culminated in both sides suffering injuries – and the students being read the Riot Act and getting gassed. More strong-arm tactics made the demonstrators firm in their resolve to still hold their scheduled rally the next day, and the Guardsmen just as determined to prevent them from doing so. On Monday, May 4, approximately two thousand people gathered for the protest planned three days earlier, despite the fact that University officials dispersed flyers on campus announcing it had been cancelled. The National Guard ordered the crowd to disperse, and the protesters, essentially, told them to shove it. The Guard began to lob tear gas canisters into the throng, but the wind direction was working against them. The protesters threw the empty canisters back at the Guardsmen, who threatened the demonstrators with their bayonets instead. Seventy-seven Guardsmen advanced on the unarmed students with rifles and bayonets, then 29 of the soldiers opened fire, expelling 67 rounds. After the last shot had been fired, nine students were wounded – and another four had been killed. Two of those shot to death had not been participating in the protest and were on their way to class. The Guardsmen later tried to justify their actions by claiming they fired because they were in fear of their lives. However, considering that all the victims were unarmed and between 60 and 700 feet away, this excuse rang rather hollow with the public. An unidentified eyewitness account was quoted as saying: “Suddenly, they turned around, got on their knees, as if they were ordered to, they did it all together, aimed. And personally, I was standing there saying, they’re not going to shoot, they can’t do that. If they are going to shoot, it’s going to be blank.” They weren’t.